Wonderful pad to hug the curves and contours of your vehicle. 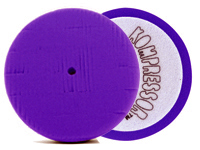 Purple Heavy Cutting 6 Inch Foam Pad – Heavy cut pad to remove severe oxidation, swirls, and scratches. Follow this pad with an orange or white pad and a fine polish to refine the paint until it is smooth. 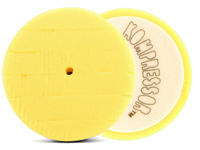 Yellow Medium Cutting 6 Inch Foam Pad – Heavy cut pad, less aggresive than purple, to remove severe oxidation, swirls, and scratches. Orange Light Cutting 6 Inch Foam Pad – Medium cutting pad to applyi microfine compounds and smoothing scratches and swirls. 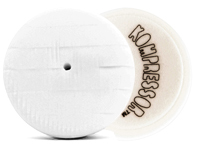 White Polishing 6 Inch Foam Pad – Light cutting pad for the application of waxes, polishes and sealants. 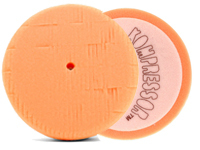 Perfect for polishing metal wheels, bumpers, and mirror covers. 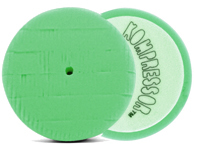 Green Polishing/Finishing 6 Inch Foam Pad – Light cutting pad, to apply one-step cleaner waxes. 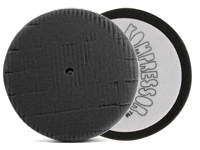 Black Finessing 6 Inch Foam Pad – No cutting power, use with machine glaze or finishing polish. Red Finishing 6 Inch Foam Pad – Very soft finessing pad, to apply the final coat of wax or sealant. No cutting or cleaning ability. 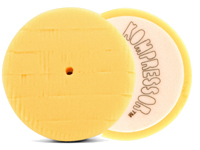 Super Soft Gold Jewelling 6 Inch Foam Pad – Super soft pad, to apply the final coat of wax or sealant. No cutting or cleaning ability. Hydro-Tech Cyan Advanced Cutting Foam - Designed for compounding and swirl removal. Hydro-Tech Tangerine Ultra Polishing Foam - Made for light to moderate defect removal and polishing. Hydro-Tech Crimson Finishing Foam - Designed to apply waxes, glazes, and sealants.